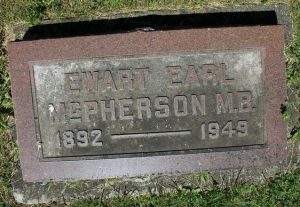 Dr. Ewart Earl McPherson was born on the 26th of October 26th,1892 in Cedar Springs, Ontario. His parents were Alexander McPherson and the former Annie Louise Nagle. He attended the Cedar Springs Public School and the Blenheim Continuation School. He also attended Chatham Collegiate Institute. He graduated M.B. from The University of Toronto Faculty of Medicine in 1916. Dr. McPherson was transferred to a Canadian Hospital in Boulogne, France in December of 1917. While he was here, he met his future wife Ethel Lunman, who was also a member of the Canadian Army Medical Corp. After his discharge, Dr. McPherson worked as the resident surgeon at St. Michael’s Hospital in Toronto from 1918 to 1920. According to the 1928 Ontario Medical Register, Dr. McPherson joined the College of Physicians and Surgeons on the 21st of May, 1919. Dr. McPherson returned to Blenheim in 1920 and took over the practice of Dr. George Bryce Kendrick, who had moved his practice to Chatham. Dr. McPherson was the Medical Officer of Health and a Coroner. Dr. McPherson married Ethel Alberta Lunman on the 10th of January, 1921 in York, Ontario. She was born on the 5th of January, 1895 in Cushendall, Ontario, (near Kingston) the daughter of Albert Alfred Lunman and the former Ellen Potter. Mrs. McPherson was the 6th of 8 children. Her father had been born in Stockholm, Sweden and he was a butcher. 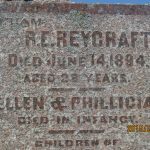 He died on the 1st of November, 1900 when she was just 5 years old. Mrs. McPherson’s siblings were; Cassie, John, George, Alfred, Alexander, Ermine and Mabel. Mrs. McPherson enlisted in World War I on the 2nd of February, 1916 in Toronto, Ontario. On her Officer’s Enlistment document her rank is listed as N.S. (Nursing Sister) and her occupation is listed as a nurse. Her address at the time, was 491 Barrie St., in Kingston. Dr. McPherson was a member of the Kent Lodge No. 274 A.F. & A.M. and a Past President of the Blenheim Rotary Club. 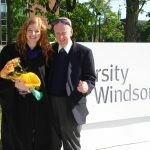 He was a member of the Kent Medical Society and the Ontario Medical Association. He belonged to the Royal Canadian Legion, Branch 185 in Blenheim. Dr. and Mrs. McPherson had two children, Alexander Hugh McPherson who was born in 1922 in Chatham and a daughter, Jean Louise (McPherson) Britton. 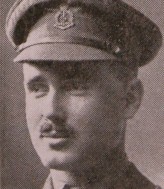 Dr. McPherson died on the 27th of November, 1949, in Blenheim. Mrs. McPherson died in Windsor, Ontario on the 30th of August, 1980. They are buried side by side, at the Craford Cemetery, 19306 Craford Sideroad, Cedar Springs, Kent County. Their son, Alexander died in 1971 and he was buried at the same cemetery. Their daughter Jean became a registered nurse. *Dr. McPherson is also featured on the ‘Gathering Our Heroes’ website. 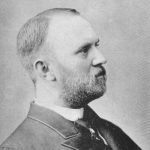 ** Dr. George Bryce Kendrick is also featured on the Chatham-Kent Physician Tribute website. Photo: Courtesy of the Chatham-Kent Museum.